Back in February I travelled to India to participate in an international conference, Dialogue on Democracy, in Panchgani, Maharashtra. I was last there 27 years ago so it was interesting to reconnect with familiar places and faces and also to see how much had changed. 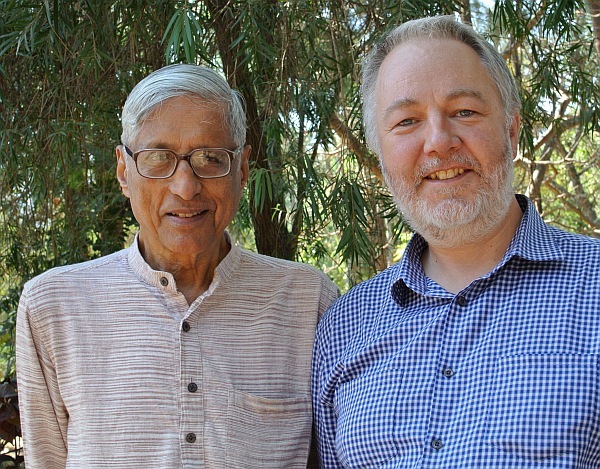 It was also a chance to reconnect with Rajmohan Gandhi, grandson and biographer of Mahatma Gandhi, and I was fortunate to share a 5-hour taxi ride with him back to Mumbai after the conference finished. Teams pull together when there is trust. So a team leader has to be, above all things, a trustbuilder. Of the many qualities needed to fulfil that role, the first quality of a trustbuilder is courage. Mike has really helped me to get clear about the way in which I work and where my time is best spent. His advice and suggestions have been invaluable. He is great to work with and I have no doubt he can provide real value to people wanting to get the best out of themselves. It is a great pleasure to know Mike. I regard him as the guru on flow and his unique ability to resolve conflict peacefully and to the benefit of all concerned. Mike is a great thinker and writer and is also great at helping people to identify their talents and bring them to their work. I trust Mike with my clients which is the highest recommendation I can give. Links to articles by Mike Lowe on other websites. Discover the Other is based in Melbourne, Victoria. Our consultancy services are offered Australia wide.